The Cullman Child Development Center (CCDC), located in Sidney, NY, is seeking a new Executive Director. The CCDC is seeking an individual with excellent communication and leadership skills to manage all aspects of the Center. This individual must have the ability to develop community partnerships adn marketing strategies in addition to overseeing the educational, financial and administrative programs for the CCDC. A Bachelors degree in Early Childhood Education and evidence of related management and educational experience are required. To apply, send resume to PO Box 211, Sidney, NY 13838 or e-mail to ccdesearch10@gmail.com. The Daily Star focused on SUNY Delhi's launch of their new alumni website. Grafiqa Creative Services designed, built and launched the social-media powered website at http://www.sunydelhialumni.org/ for the SUNY Delhi Alumni Association. Read more here. Learn more about Grafiqa here. 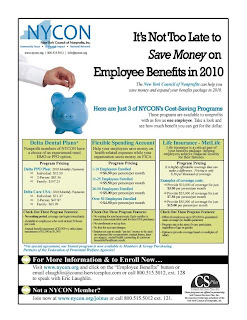 NYCON members receive a discount on services. o Panel discussion featuring nonprofit professionals sharing and discussing policies for the board, volunteers and interns. Last week NYCON was asked to provide feedback to the Comptroller's Office on how late New York State contracts and payments were affecting real nonprofits in the community. NYCON has already collected almost 250 responses - and more nonprofits are responding every day. • 66% of nonprofits responding said that they had borrowed money because of delayed government contracts and/or payments in the last two years. Well over 100 comments were also submitted to the Comptroller´s Office. Click here for a sampling of these comments (a full list will be posted soon on the NYCON website.) Still want to add your feedback? Click here for the survey. Want to know what else you can do? The Comptroller's Office will be holding nonprofit forums around New York State soon. NYCON will inform our members when those forums are scheduled. A Package price for both is only $1,000. Interested? Click here and let us know and we´ll have one of our legal staff get back to you to start the process! Another important element of risk management is the maintenance of the proper form of corporate existence. Our attorneys and legal staff will analyze your Certificate of Incorporation, and any Amendments for consistency between them and your internal corporate documents and Bylaws, returning the same to you with revision comments and "best practice" advice within 15 days. A Corporate Document Review is $300.00. The Evening Sun reported that the Norwich High School Youth Philanthropy Council is a foundation at Norwich High School comprised of 10 upperclassmen. During the fall semester, students completed a non-credit course taught by community leaders in the fields of non-profit organizations, foundations and grant making. The Council, now in its second year, was developed and supported through the collaborative efforts of the Upstate Institute at Colgate University, Chenango United Way, The Community Foundation for South Central New York, and Norwich High School. In 2010, the YPC will distribute a total of $10,000 to not-for-profit agencies in Chenango County. The money being granted by the Youth Philanthropy Council was donated by Chenango United Way, The Community Foundation for South Central New York, and NBT Bank. The Youth Philanthropy Council is now seeing proposals from non-profit organizations looking to break the cycle of poverty in Chenango County by providing education to low income families. The hope for funding is to prepare families to sustain themselves in the future rather than provide immediate relief?in essence, to help families help themselves. Proposals should reflect a careful rationale for the project. Grant applications will be accepted for requests up to $5,000, but full funding may not be available. Programs that received YPC funding in 2009 are not eligible to apply for funds in 2010. The Daily Star related in a recent article that the city of Oneonta will run a $2 million deficit by 2012 and exhaust its reserve funds by 2013 with the current trend. A number of proposed cost cutting ideas and reductions are being discussed, but the city is also looking at ways to increase revenue. One such idea mentioned was payment-in-lieu of taxes agreements for nonprofit entities. Focus on this area is growing across the region, and nonprofits clearly need to make this issue a priority and work to address it. Have ideas on next steps or suggestions for action? Share them here or e-mail us. The Daily Star reported that Mothers & Babies Perinatal Network announced the schedule of annual community forums to be held throughout Broome, Chenango, Cortland, Delaware, Otsego, Tioga, and Tompkins counties. These annual forums provide an opportunity for local leaders and policymakers, health and human-services providers and consumers to raise issues, make suggestions for programs or services and to comment on and learn more about the work of the Perinatal Network, presenters said. Locally, a forum will be held from 9:30 to 11:30 a.m. Tuesday, Jan. 12, at FoxCare Center in Oneonta, and from noon to 2 p.m. Tuesday, Feb. 9, at Chenango Memorial Hospital in Norwich. The forums will feature presentations on the network's work from the past year. Those who attend may share information about local or personal-service needs, concerns or other issues. Those who plan to attend are asked to register by calling 772-0517 or (800) 231-0744. For more information about the network, visit www.mothersandbabies.org. Take a look at three of NYCON's most popular programs. NYCON adminsters each of these programs, answers your questions, and gives you and your employees the customer service and value you deserve! The flyer outlines NYCON's Delta Dental Plans, Flexible Spending Accounts, and Life Insurance Plans. Four employees at Foothills Performing Arts Center were fired Tuesday, and two others resigned in support of their colleagues as the arts organization struggles with a fiscal crisis. The Foothills board of directors cited financial reasons for the dismissals, said the former employees, who accused the board of cronyism, lack of cooperation and misuse of public money. Former Executive Director Jennifer McDowall, one of those fired Tuesday, called for the board members to resign and for public scrutiny of the center's construction and operations. McDowall and the five other former employees held a media conference at the downtown Clarion Hotel on Tuesday morning after ending their employment at Foothills, a complex a few blocks away across Market Street. Read more here. Starting your own charity has been a popular idea in these recessionary times, spurred both by downsized workers re-evaluating their career choice and what some have called the Compassion Boom. "There's a high interest right now, tied to fact that the economy has people thinking about what they want to do," said Margaret Linnane, executive director of the decade-old Philanthropy & Nonprofit Leadership Center at Rollins College. "They figure, 'Since I'm out of work, maybe I'll be fortunate enough to find something in an area where I can serve the community.'" But starting your own charity is another matter. The process takes much more than a noble idea or sincere heart. "Anyone who thought it was going to be simple … learns quickly that it's not so easy," Linnane said. "And a lot of people mistakenly think if they have a great cause, there will be no problem having their idea funded." There's a lot of bureaucracy involved, a fair amount in fees and a whole lot of homework. And that's only to launch it. Of Florida's nearly 50,000 public charities in 2008, fewer than half made $25,000 or more in gross receipts — meaning the majority never raised enough money to pay anyone a decent salary. At the Rollins philanthropy center, which teaches a class on starting a nonprofit, Linnane said many students discover that running a charity is much more administrative work than they imagined — when what they really want is the face-to-face human interaction. Ultimately, "nonprofit" is only a tax status. You're still essentially starting a business. In the past decade, there has been a "pretty dramatic" increase in the number of public charities, said Steve Delfin, president and CEO of America's Charities, a Washington, D.C., nonprofit that helps employers run workplace-giving campaigns. The number of public charities registered with the Internal Revenue Service, for instance, increased 60 percent nationally from 1998 to 2008, and the number in Florida nearly doubled. It is still too early to say what happened in 2009. But not everyone thinks growth is a good thing. "There is a lot of redundancy and duplication," Delfin said. "And as in any industry where you get a lot of growth, now I think we are going to see this whittling down." There is some evidence that's already happening. For the first time in decades, individual charitable donations dropped in 2008, compared with the year before. With less money being split among more charities, some nonprofits found themselves laying off employees, cutting programs or closing altogether. Daunting? Maybe. But for the bold, visionary and determined, the experts contend, success is still possible. It just may take longer. Read more here.